I was on travel for work this week which mean any blogging or work on my website was delayed. When I returned, I had an email that was thanking me for my “Difficult Bird ID” page, where you can find information on differentiating between commonly confused species. There was also a request to add another page, discussing how to tell apart the three North American goldfinch species. I don’t normally think of goldfinches as a particularly difficult group to identify, but then again, here in eastern South Dakota, we only have the one species. Overall, geography is obviously a huge part of identifying goldfinches, as in the eastern half of the country, the only species of goldfinch you’ll find are American Goldfinch. However, if you happen to find yourself in parts of the southwestern US, you have three goldfinch species you may potentially encounter, with Lesser Goldfinch and Lawrence’s Goldfinch join the party. The woman who sent the email lived in California and specifically was trying to figure out how to easily identify female goldfinches. That does represent more of a challenge than differentiating male goldfinches, and given that my Difficult Bird ID pages are some of the most visited pages on my entire website, I thought tonight I would go ahead and create another page that talks about ID keys for the three species. As with many “difficult” IDs, for birders I think that difficulty melts away with experience, particularly when given keys to look for. Creating a page such as this helps me as well! I don’t run into Lesser Goldfinch, for example, unless I travel, but I don’t know if I could have identified a female goldfinch as either Lesser or American in the areas they overlap in range, until creating this page. Now I’ll know what to look for (bill color, and undertail covert color are giveaways). A bit of a pain to create these pages, but as I said, they are frequently visited. Click below for the new Goldfinch ID page. Females of the three North American goldfinch species. Males in breeding plumage? Piece of cake. A little bit harder for the females (particularly American and Lesser), but not bad when you know what to look for. Human beings are funny creatures. When we see something, we immediately want to categorize it. For a birder, identifying and tallying species is a huge part of the hobby. For my work as a scientist working with satellite imagery, my task is to categorize the types of land cover (cropland, urban, deciduous forest, etc.) on the earth’s surface. 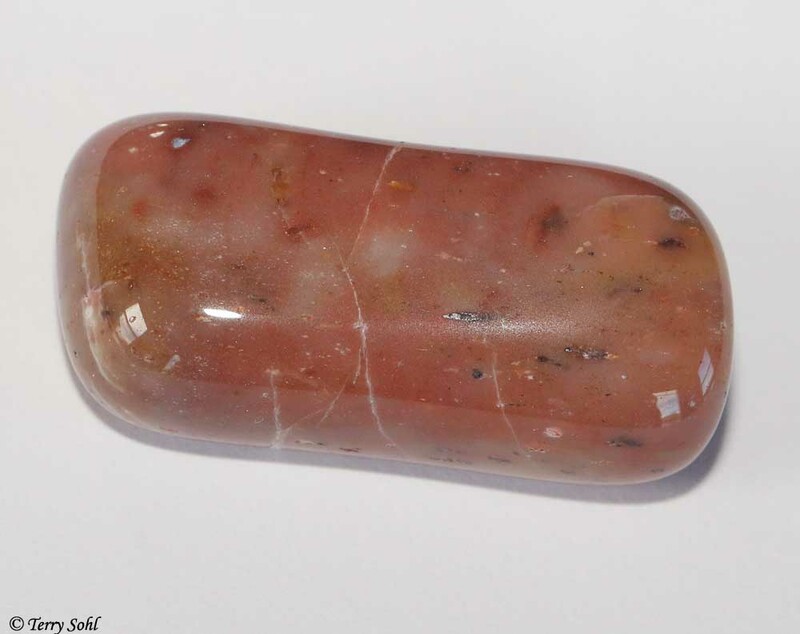 For a rockhound? I’m struggling with identification as a rockhound newbie, just as I did 20 years ago when I was a birding newbie. 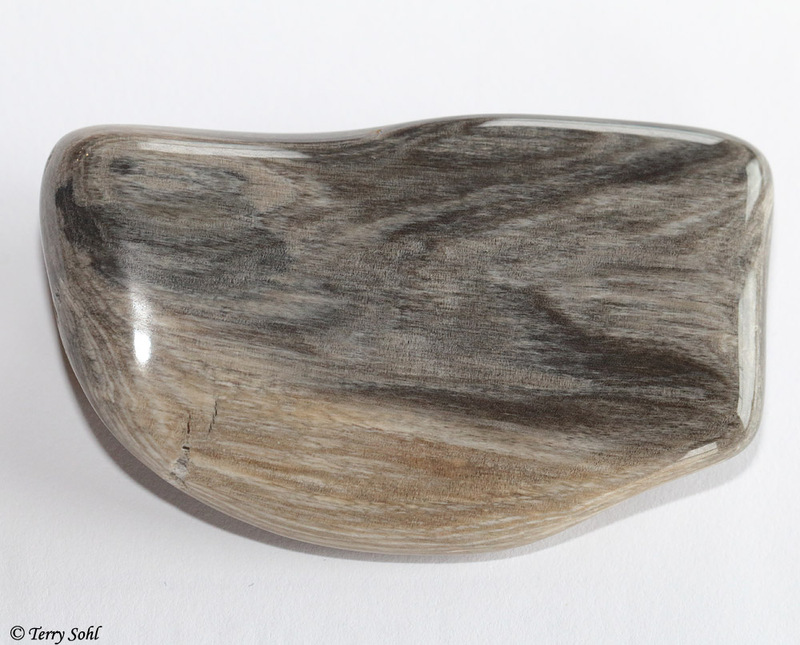 Petrified wood is one category of material I thought was easy to identify. When I’m out on the Buffalo Gap National Grasslands, there is a LOT of petrified wood lying around. By that, I mean there’s a lot of easily identifiable pieces that look exactly LIKE wood, with obvious grain patterns. But as with anything in life, it’s not that easy. Below are some of the obvious, and not so obvious pieces I’ve found on the Grasslands. Thoughts? Are all of these petrified wood? 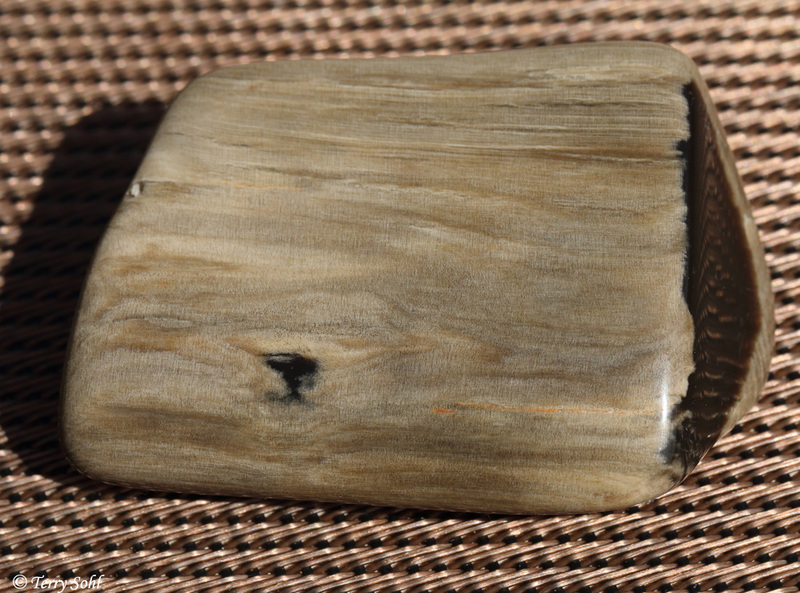 First, an obvious piece of petrified wood. This is what I find the most of…gray exterior pieces with clear grain patterns, some of which are so detailed they look like fresh pieces of wood. Another obvious one. Both of these first two pieces have also been tumble polished to a nice shine. And this piece? 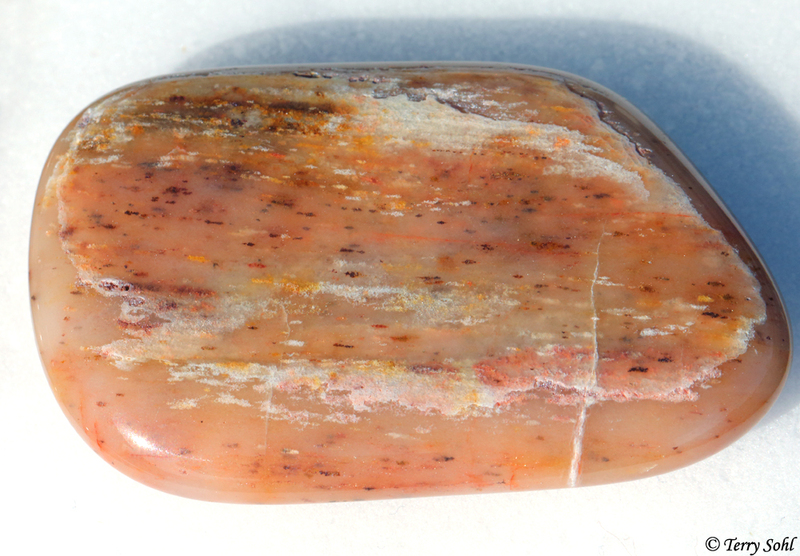 This is the most colorful piece I’ve found, for something that’s possibly petrified wood. You certainly see a linear “grain” running throughout. 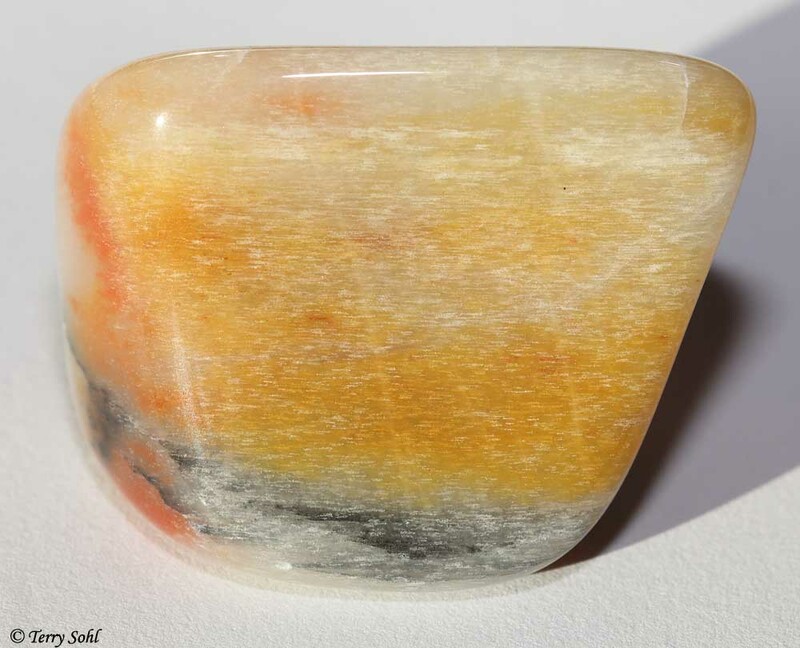 Petrified wood? 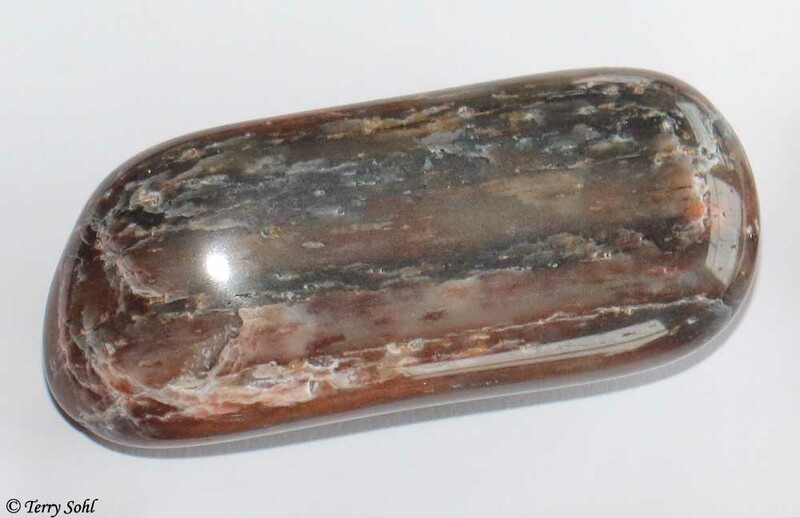 Perhaps an agatized petrified wood? Same piece as above, except on the flip side. Again, you see the grain pattern throughout. A less obvious one. The photo doesn’t show it as clearly as what you see through a loupe, but there are rough “grain” patterns. They’re more little streaky nodules all oriented the same direction. I know there’s petrified palm that can be found in this area, but I don’t know what exactly the palm looks like from this area. A similar one, with little linear nodules lined up in the same orientation like a wood grain (again, a bit hard to see in this photo). 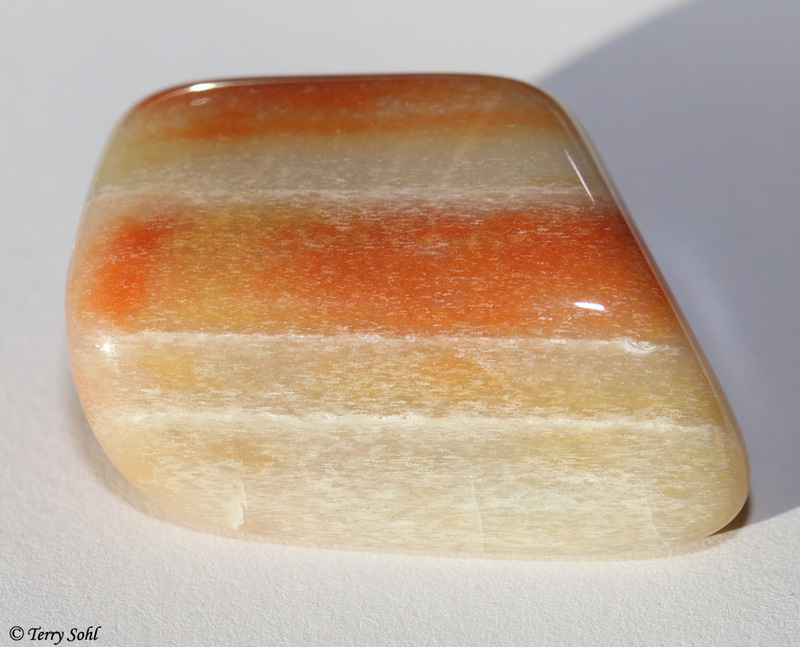 The photo of this piece does a better job showing the type of “grain” seen in the previous two pieces as well. Obvious, and all oriented in the same direction. When this guy flew by and I took photos, what first came to mind was dark-phase of a Rough-legged Hawk. It’s actually a dark-phase Ferruginous Hawk. The vast majority of Ferruginous Hawks that you run across are light phase, so this guy is a perfect example of how confusing it can be sometimes to identify Buteo hawk species. As I look through visitor stats for my main website, one of the sections that is visited the most is a “Difficult ID’s” section. That actually surprised me a bit, given that it’s a fairly small part of the website, and not a section that I’ve revised for quite some time. The section is devoted to helping birders differentiate between certain species that tend to be difficult to identify, with photos, identification tips, key plumage characteristics, and other information. I only had 10 different classes of birds that it helped to differentiate…thus my surprise to see how many visitors those pages get. For the first time in probably 7 or 8 years, I updated several of those pages, providing more detailed identification keys, new photos, and range maps to help people see where and when certain species are likely to be present. 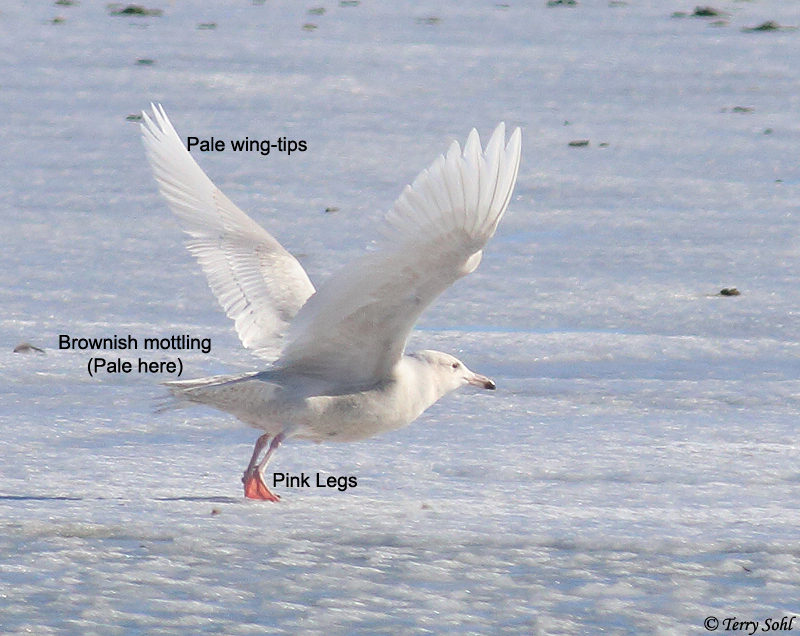 I also started to think about other species that birders may have trouble identifying. On these pages, I’ve restricted myself to the more common Buteo species that are found in South Dakota and the U.S. as a whole. The more rare or geographically restricted species, such as Gray Hawk, Zone-tailed Hawk, or Short-tailed Hawk, were excluded, so the page could concentrate on the more common species in the U.S. Species included are Red-tailed Hawk, Ferruginous Hawk, Swainson’s Hawk, Rough-legged Hawk, Red-shouldered Hawk, and Broad-winged Hawk. For these 6 species I have several pieces of information to assist birders in identification challenges. That of course include photos that offer a variety of angles, color morphs, bird ages, etc., as well as identification keys and species range maps. 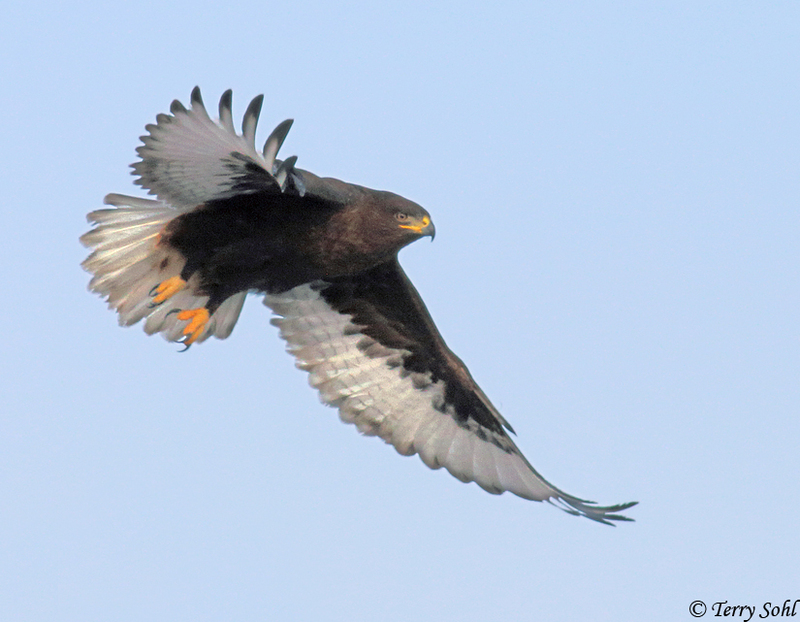 The Buteo Hawk page is undoubtedly the most comprehensive of the “difficult ID’s” pages that I’ve put together to date…I hope that people find it helpful! A (new favorite!) photo of a Carpenter bee on a bloom. The species of Carpenter Bee? Uh…WHOA…would you look at the time…uh…I gotta run, I’ll catch up to you later!! 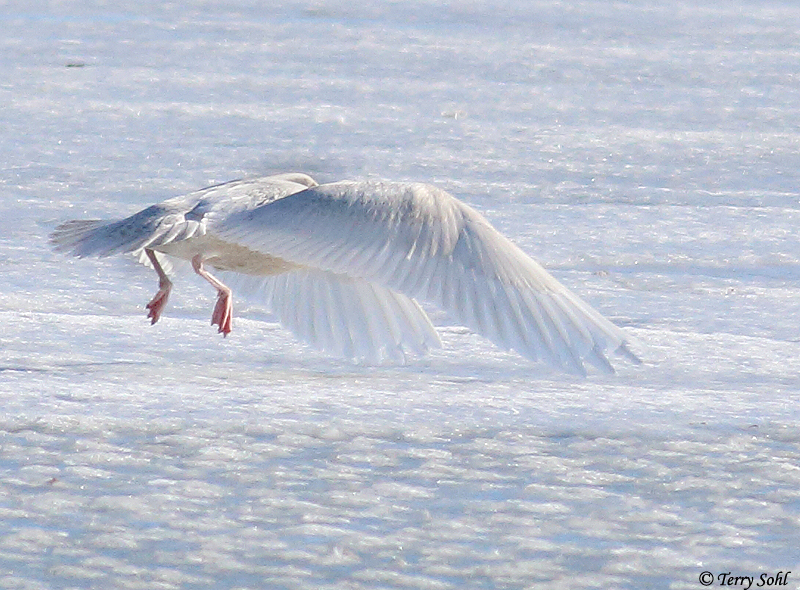 When I started photography 15 years ago and started shooting birds, I knew absolutely nothing about my subject matter. Species identification? Hah! For the first several months I was constantly bugging my friend Jim at work with identification questions, showing him photo after photo while he patiently helped me identify birds. After this much time, I’ve photographed most birds you could expect to find in South Dakota, and I have very little trouble identifying birds from sight or from a photo (by ear is another matter…). It did take a while though to become proficient in bird identification. After all, there are about 430 species that have been seen in South Dakota. Now as I’m getting into macro photography, i”m having the same issue with insects and spiders, but the magnitude of the problem is MUCH worse! In the continental U.S. and Canada, there have been over 900 different bird species sighted, including many stray birds, and many pelagic birds you’d never see unless you were off the coast some distance. In the U.S. alone, there are over 4,000 BEE SPECIES ALONE!!! Many insect species are also differentiated from each other by only very small ID keys. In other words…it’s DAMNED hard to nail many insects down to a given species. I’m not satisfied taking a bird photo, but not knowing the exact species. With macro photography and insects…I’m going to HAVE to be satisfied in most cases not knowing the exact species, but perhaps only arriving at the basic genus that species belongs to. The photo above of a Carpenter Bee (I think!!) is a good example. 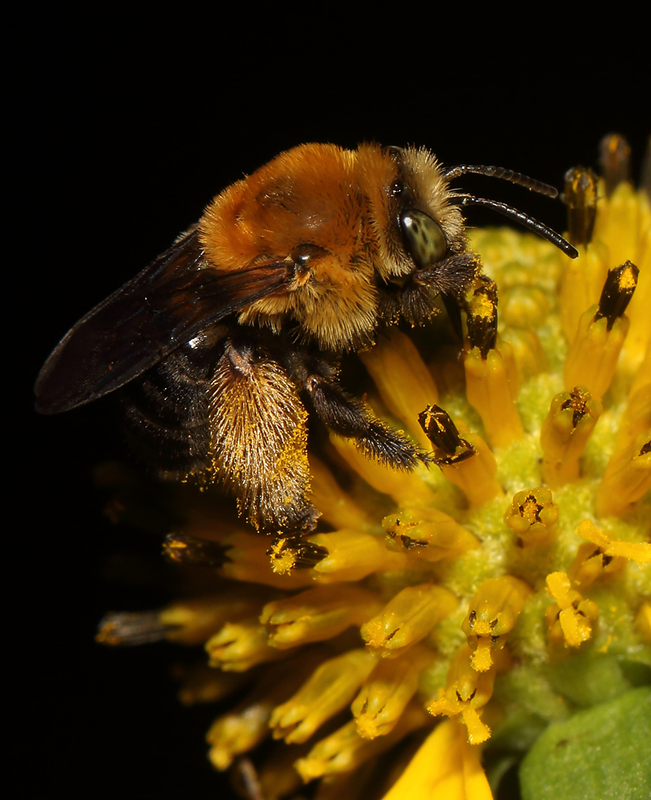 There are over 500 species of Carpenter Bees worldwide. .But as soon as I took this photo and looked at it on my screen yesterday, I knew it was instantly one of my favorite photos! Which kind of Dowitchers are these? Click to get a much higher-resolution version. More info than you can shake a stick at! But I’m still not sure that it helps me. Given that I live in South Dakota, where we’re much, much more likely to find Long-billed Dowitchers, I have pretty much always called Dowitchers I take photos of here Long-billed Dowitchers. But over the years, I also have no doubt I’ve seen, if not photographed, Short-billed Dowitchers. So, tonight I was birding around Newton Hills State Park, and came across a group of 15 Dowitchers. 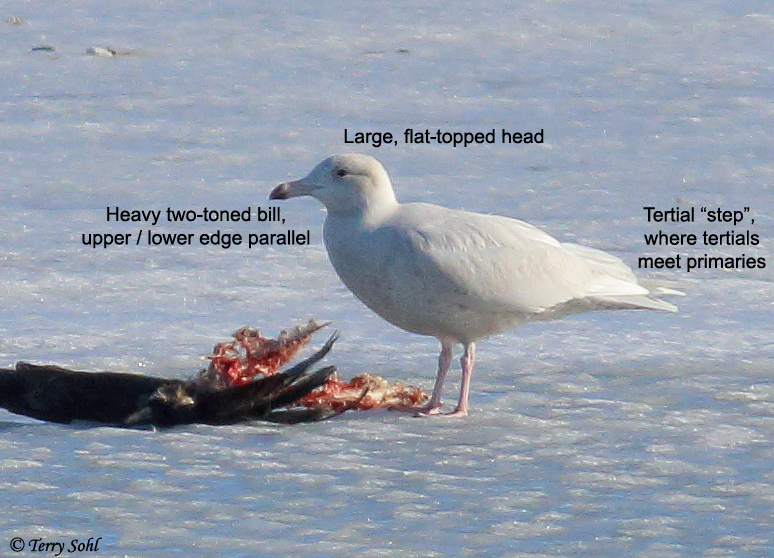 Long- or Short-billed? Check out the photo above. What are they? All Long-billed? A mix? Bill length, as expected, is one of the ID marks in the SurfBirds article above. Check out the 2 birds with an “A” by them. The one on the left has a much longer billl than the one on the right. Leg length is supposed to be another mark, with Long-billed Dowitchers having longer bills. Again check out the birds labeled “A”. The one on the right has the water reach his belly, while the birds right around him have leg showing. Same for the one bird in the back by the “B”, where one bird has water reaching the belly, and the other two don’t. The SurfBird site has many more ID keys, such as a supposedly straighter supercillium on the Long-billed, but even on their example images I find that hard to see. Plumage differences and shape differences are noted there as well. Any thoughts out there? What are the Dowitchers in this photo?